—So what have you begun to understand from measurements taken using hitoe? Tsukada: Our data is still limited but as an example, we used hitoe to measure levels of stress during sports competition and how it differed between people. Interestingly, we found that it tended to differ by level of experience and skill. Of course heart rate increases with activity, but the point here is that by separating the part that is due to activity we were able to isolate the component due to stress (See Part 3). We also attempted measuring heart rate during the final push at the end of a marathon or a bicycle race. Results showed that competitors reached the finish line with quite abnormal heart rates. There is past laboratory data showing this, but we saw even higher results, and were surprised by how much the data exceeded heart rate values that would have been considered dangerous before. Of course, these athletes undergo special training, so they can exert their power without becoming short of breath even though they are exceeding maximum heart rates, but we saw heart rates beyond what we would have imagined. Surely this type of data has not been seen by anyone before. 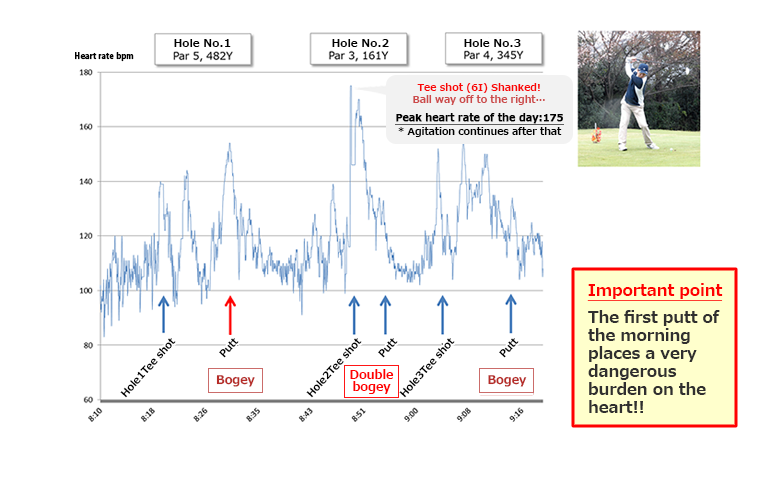 Nakashima: Figure 1 shows data on my mental state while playing golf. Golf is considered to be a sport where play is susceptible to mental activity. Stress can be particularly high for the first hole in the morning, and I have seen and heard of cases where elderly players collapse on the first hole. So, I decided to try recording my own data. I was surprised to see how high my own heart rate rose on the first hole, even though I was completely unaware of any nervousness. Then, for the tee shot on my second hole, I hit a shank, with the neck of the club hitting the ball and sending it off to the right. “Damn!” I said, and my heart rate shot up. You can see here that this followed me for the rest of that hole (smiles). Tsukada: Electromyograms can also show gradual changes as time passes in real time. As muscles are used, they fatigue, making it difficult to apply power and sometimes causing them to cramp suddenly. The fatigue associated with such drops in performance can also be visualized. This has great significance for recording electromyograms during training. 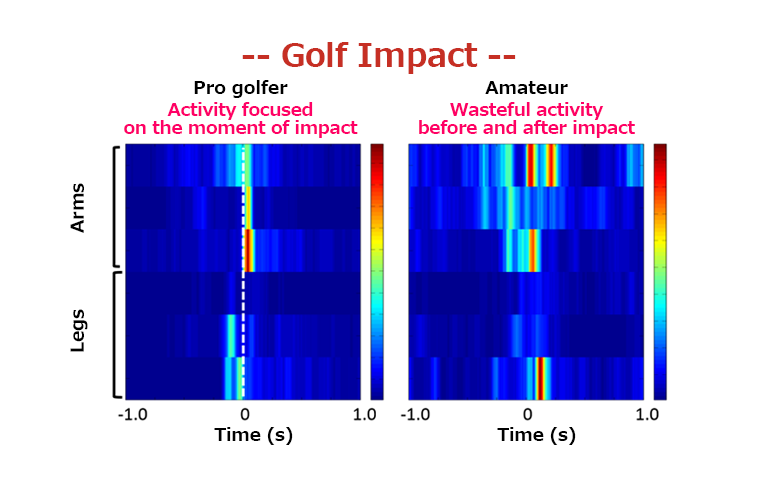 Nakashima: Looking at the differences in muscle activity between a professional and an amateur golfer at the moment of impact is also interesting. The pro appeared as though completely exhausted just before and after impact, and showed focused muscle activity only for the moment of impact, while the amateur used wasted effort before and afterwards. Amateurs also tend to arm-swing, attempting to send the ball using just the arms. Using electromyograms in training could be effective just to see differences such as these. Tsukada: This really is valuable data showing how top athletes have mastered how to move and use their minds and bodies. It shows that the closer a person becomes to being a top athlete, the less show of strength they give, moving extremely efficiently and only applying the strength actually needed in order to win. We also see that they are able to use even more power in real competition than they do during training. We amateurs behave in the opposite way, with excess shows of strength in competition. Knowing this, we can see to some extent, who will perform better and who will perform worse in competition. —How has the reaction been after almost two years since product sales began? Tsukada: Fortunately, it has been quite popular with amateur athletes, especially high level athletes. On the other hand, top professional athletes need a more multi-faceted approach to their bodily state, incorporating data such as electromyograms and acceleration in addition to heart rate. Accordingly, we have athletes trying out some of our new prototypes. Some of these professional athletes have given feedback that such previously unavailable, real time data on muscle activity and acceleration is very valuable. They indicated they would be very happy to be able to use it in their training. We have received comments indicating that even professionals have good and bad times and are sometimes not conscious of these changes, so they would like to see objective data. Others have also said that having once been injured, they would hope to avoid causes of injury before it occurs by watching their state of fatigue and otherwise monitoring how their bodies are moving. We hope that our products can be useful in reducing injuries and improving performance efficiency in the future. —Is demand increasing as the 2020 Tokyo Olympics approach? Tsukada: Yes, but as competition in global development heats up, we are increasingly feeling pressure. Japanese manufacturing is known for having an excellent balance between function and usability. We want hitoe to embody this quality as a Japanese product, and to develop it as a product that athletes will be excited to use. We enjoy sports ourselves, so we want to create a tool that we are satisfied with ourselves. At the same time, it will also be necessary to develop applications that are usable by the general public. As soon as possible, we want to implement applications that can provide coaching, such as how to move properly or when to rest. In the future, we would also like to incorporate AI technology to analyze stored biological data, so that guidance and warnings can be produced automatically. —What sort of schedule have you set for these developments? Tsukada: It depends on what level of implementation we are talking about. We should be able to implement features like displaying endurance or speed to support training relatively quickly, but longer-term research will be needed to meet the more advanced demands of the top athletes. Personally, from my experience as a plastic surgeon and seeing people with sports injuries, I feel strongly that I would like to reduce the number of such cases, even if just a little. Many injuries are caused by overtraining. The tendency of Japanese people, in particular, to train seriously and diligently, and persevere through will-power also contributes to this, and we have many cases of injury due to accumulated fatigue. We would also like to implement systems to help people train appropriately, and break this negative cycle as quickly as possible. Nakashima: There are striking differences between the USA and Japan in baseball training too. In the major leagues, they actively pursue efficiency in training, but in Japan, training times are very long, even in high school and university baseball. Professional pitchers might throw 200 or 300 balls in the bullpen. It’s part of the coach’s job to limit such overtraining, and we think hitoe could help in this. On the other hand, while catching 1000 batted balls without rest can be grueling at first, you gradually learn where effort is not needed, and to predict where the ball will come from the batter’s swing. To develop such skills, sometimes you just need to repeat many times. We refine our skills by accumulating experience. As such, this process of accumulating training is necessary in sports, but there is no point in overdoing it. We would like to be helpful in avoiding this sort of overwork. —Both of you like sports; has this been useful in your research too? Nakashima: Yes. My main hobby is golf, but I played baseball in elementary school and after graduation, and I go walking and running on my own. These have been helpful in developing hitoe in various ways. I am hoping to use hitoe to train efficiently and to run a full marathon sometime in the future. Above all, I am very happy that all of my research on polymer materials has unexpectedly become connected with my interest in sports! I am very thankful to have met Dr. Tsukada. It is certainly a chemists dream come true, to have materials that I’ve worked on used around the world. There is nothing that could make me happier than seeing it made practical and found useful throughout the world. Tsukada: In my case, I turned from surgery to basic medical research in 2010, to improve electrodes needed in nerve regeneration research at NTT Basic Research Laboratories. But I feel that my research has greatly increased in breadth since arriving there. 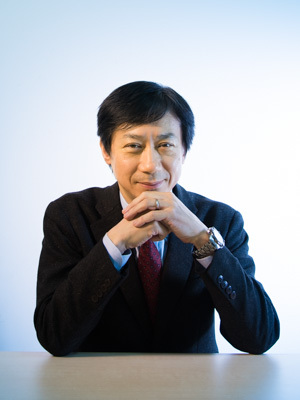 Having many diverse researchers like Dr. Nakashima is a strength of NTT, and meeting researchers from other fields produces chemical reactions that lead to development of interesting results like hitoe. Like Dr. Nakashima, I am also happy that my interests in mountain climbing and running have been useful in my research. Having been a surgeon has also been very useful in this research, since I’m good with my hands and can sew well. These skills were particularly helpful when we were making hitoe prototypes—I went to Okadaya and Yuzawaya (fabric shops) to buy materials and made garments myself (smiles)! Initially they were hand stitched, but eventually we bought a sewing machine, which I mastered as well. Incidentally, the hitoe undershirt I was wearing for our press release was one that I sewed myself. Tsukada: In motorsports, Tony Kanaan also wore hitoe to monitor bodily data in the IndyCar series, and I made all of those garments by hand too. This was because the regulations in motorsports are strict and all garments must be fire resistant. There are also various restrictions on transmitters, so they were completely handmade to special specifications, from design to prototyping, hand dyeing, and wiring. It was a very tight schedule to deliver them in time for the race, and frankly a hellish few days (smiles)! —And in spite of this, were you able to collect some interesting data? Tsukada: Yes, we did. We found that, although IndyCar is a simple oval track, his heart rate increased greatly on one of the four corners. When we asked later, he said that there was some unevenness in that corner, making it difficult to steer. For that reason, even for a veteran like Tony, his heart rate increased when approaching the corner. In the electromyograms, we also got data showing how he was using his body to counteract the strong acceleration he was subject to while cornering. 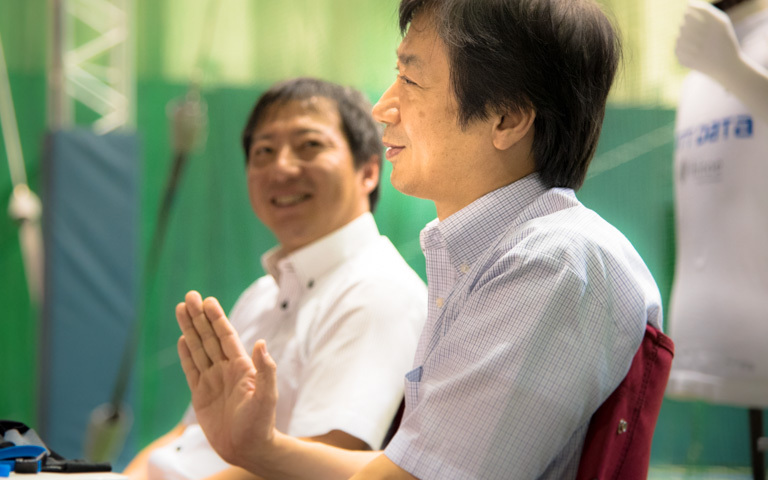 Nakashima: Having learned these types of things, we expect that we can use hitoe in managing physical conditions for various other drivers and equipment operators beyond motorsports, and we look forward to expanding into these areas in the future. Research Specialist for NTT since 2010 and joined NTT in 2013. Medical Doctor. Changed from plastic surgeon to researcher and worked on development of hitoe. Specializes in research on explaining and controlling how information is transmitted in cranial nerves. 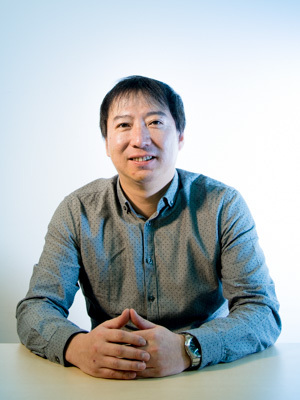 Recently in charge of R&D on hitoe; wearable and implantable bio-electrodes built on conductive-polymer-fiber-composite materials. Aiming to use long-term measurement of biological signals for prevention and early detection of disease. Joined NTT in the NTT Basic Research Laboratories in 1997. Ph.D. (Engineering). Since joining NTT, conducting basic research on design and synthesis of polymer and nano-bio composite materials and evaluating their physical properties. 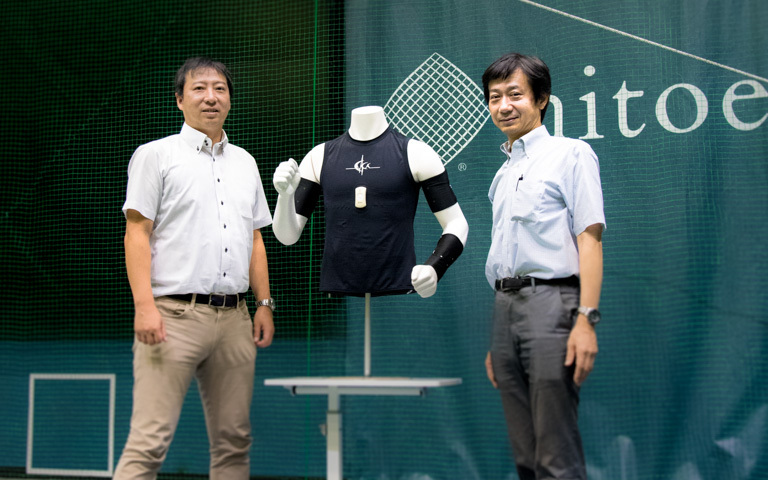 Participating in the project since hitoe was first invented, and still engaged in R&D on deep biological information using hitoe wearable devices. Aiming to contribute to society through use of conductive polymers and other soft materials to manufacture novel materials.